Game description: Fire up the fret board, crank the amp to 11 and get ready to rock this way with Activision's Guitar Hero: Aerosmith. 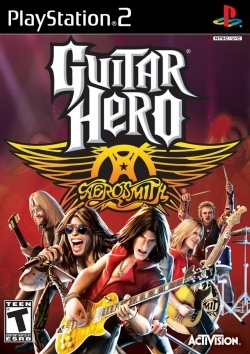 Guitar Hero: Aerosmith is the first game built around the legendary music of America's greatest rock n' roll band: Steven Tyler, Joe Perry, Brad Whitford, Tom Hamilton and Joey Kramer. Fans will experience Aerosmith's GRAMMY award winning career, from their first gig to becoming rock royalty, in a way that no other entertainment vehicle offers. It is the first game in the series to primarily focus on the work of one rock band, with Aerosmith songs comprising approximately 60% of the soundtrack, while the remaining songs are from bands that have been influenced by or opened for Aerosmith. The single player Career mode allows the player to follow the history of the band through several real-world-inspired venues, interspersed with interviews from the band members about their past. Runs near full speed., Graphics are corrupt if gsdx is in hardware mode. Looks fine in software mode.